This month we’re going to take a look at the various technical aspects of pistons designed for performance and competition engines. If we consider the extreme environment of combustion pressures and high temperatures that regular cast replacement pistons operate in, it’s quickly apparent that when these values are increased it necessitates using a much more efficient component able to withstand these elevated levels. Add to that the much higher and/or sustained RPMs of the engine that could quickly devastate a normal cast part, and selection guidelines become critical. Vertical gas ports, like their horizontal counterparts, are designed to apply pressure to the back side of the top ring to increase sealing load. Which to use when is a question you should ask of your piston supplier. There are two types of pistons, cast and forged, and they are manufactured using pretty much the same method as crankshafts except we’re dealing with aluminum instead of steel. In a cast piece, melted aluminum alloy is poured into a mold which, when cooled, produces a piston that closely resembles its final shape. Casting requires less machining and can be more cost efficient. The forging process involves placing a heated billet of aluminum alloy into dies. Extremely high pressures compress it into the rough shape of the piston blank. This process requires more machining operations to produce a finished part, which therefore add to the cost. As with a crankshaft though, the forging process gives us a part that is much denser with greater ductility than a cast piece. All cast pistons contain a certain amount of silicon, generally 10-12 percent, the amount of which is known as the “eutectic point.” Changes to the aluminum alloy can, however, produce stronger cast parts better able to withstand higher output demands. These, known as hypereutectic pistons, have additional silicon added to the alloy that raises it to a 16-18 percent level in the mixture. The piston is still made by the casting process but by increasing the silicon content it gives us a stronger part which also has better thermal efficiencies to handle higher power levels. Hypereutectics can be very cost effective and may be utilized in many applications but they still have limits as to how far they can be pushed and this is where a forged piston becomes a requirement. 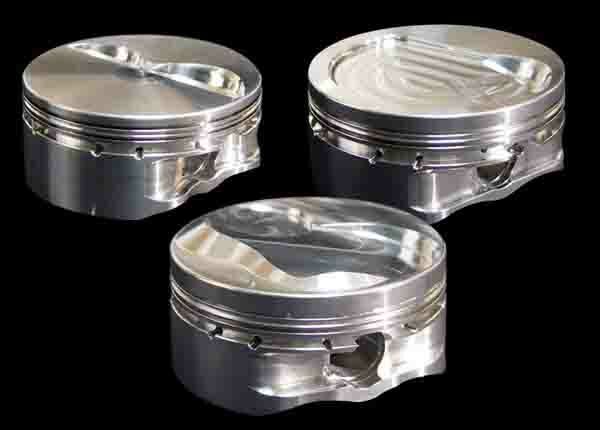 Forged pistons are manufactured in two basic alloy configurations, 4032 and 2618. Similar to cast pistons, 4032 forgings generally contain 10-12 percent silicon and are very efficient in numerous applications even when using nitrous oxide or forced induction at moderate levels. The silicon content aids in providing a lower expansion rate of the material as compared to 2618 alloy and can be run with tighter piston to cylinder wall clearances for increasing the lifespan of the engine and also produces less operating noise while the engine is reaching operating temperature. When it comes to tensile strength between the two, the gap isn’t as large as some might suspect. 4032 has a rating of about 54-55,000 psi, with 2618 coming in at 64-65,000 psi. A 4032 piston is slightly lighter than the 2618 equivalent. Various designs are used by manufacturers to increase strength while simultaneously reducing weight from the piston. Slipper skirt, full round and side relief designs are the most predominant types. For high-powered street, maximum competition, high boost forced induction, large doses of nitrous or just about any other build where the pistons have to be as strong as possible, 2618 is the material of choice….or to put it another way, when you’re absolutely, positively intent on squeezing every single drop of horsepower out of your engine no matter how hard you have to push it, use the 2618 material. This material contains very small amounts of silicon content, usually only 1 percent or less, which produces very high malleability and their strength and thermal characteristics give them the ability to operate in the most extreme conditions. They have a greater expansion rate than 4032 and should be set up with additional clearance to accommodate the growth factor of the piston as it reaches operating temperatures. Because of this they produce more noise than the 4032 when the engine is warming up but their ability to withstand high temps and pressures automatically puts them on the build list for all out power. 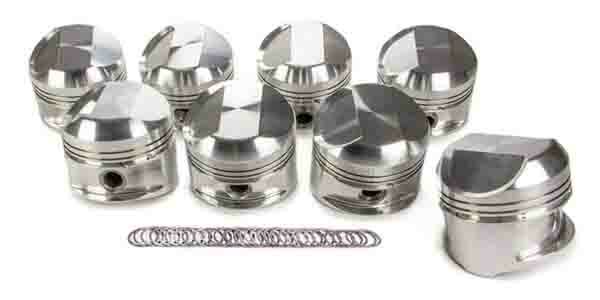 One more style of forged pistons is billets. Billets are made from the same 4032 or 2618 alloy but instead of being produced in forging dies they are machined from solid bar stock. This gives manufacturers the ability to produce a unconventional forging that may fall outside of the predetermined values from forged blanks. They are also great for producing prototypes for testing purposes before committing to an actual piston design. In addition, a set of billet pistons can provide huge benefits in antique and vintage engines where a replacement piston may be completely unavailable otherwise. Whichever type you use, the higher strength characteristics and greater ductility will always make a forged piston the best choice for any application that demands maximum horsepower. Various designs are used by manufacturers to increase strength while simultaneously reducing weight from the piston. Slipper skirt, full round and side relief designs are the most predominant types used in current piston technology. 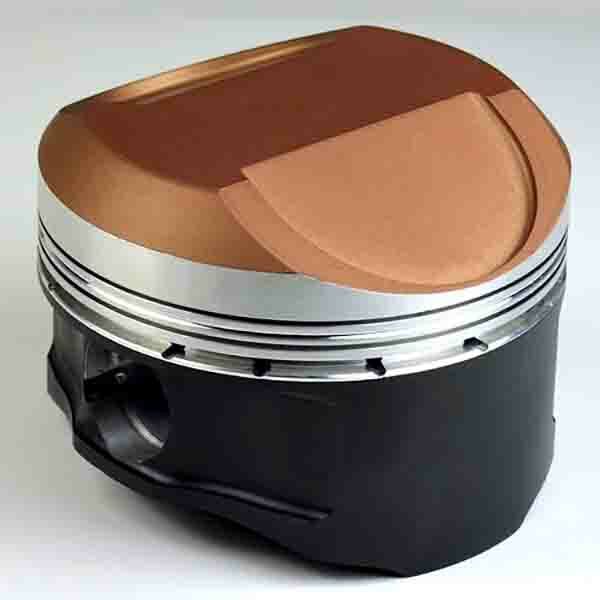 This Hemi piston has both anti-friction and ceramic coatings applied. Slipper skirt designs are intended to decrease the amount of contact area compared to a more traditional full round design and only employ skirt area on the thrust sides to provide operational stability. The side reliefs are forged in place, which also removes considerable weight from the piston and allows it to function well at higher engine speeds. Another variation of this style sees the pin boss moved further inward to use a shorter wrist pin and provide more clearance while again providing additional weight savings. Strengthening ribs can also be designed into the piston to reinforce the pin boss area. 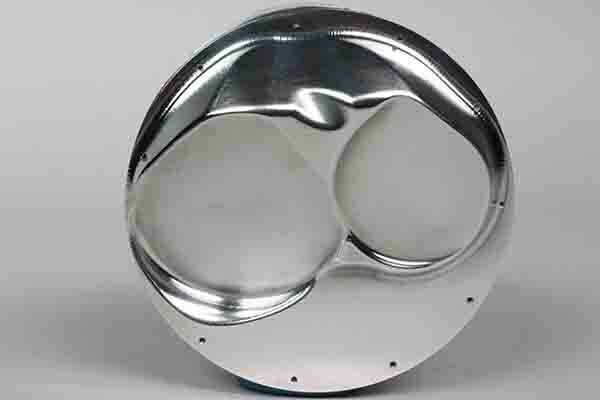 Another variation is the use of asymmetrical skirts, which provide a greater surface area on the major thrust face of the cylinder and reduced on the minor thrust area. 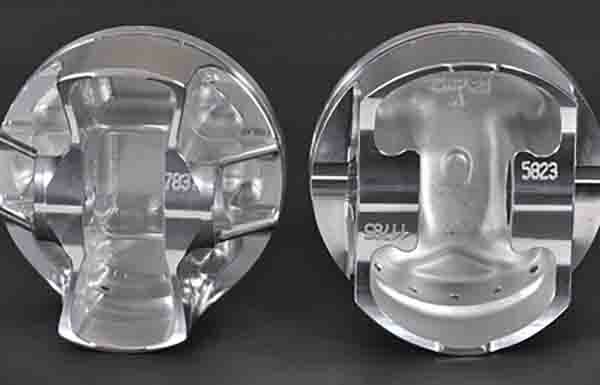 Full round designs provide the largest amount of skirt area but can have side reliefs machined in place for many applications. This design can be utilized in applications that will see very high pressures because of the amount of contact area. The lower band below the pin area can be left for stability purposes or machined away for additional counterweight clearance on large stroke engines. If you aren’t quite sure about the best piston design to use for your build (or specific features) call the manufacturer of your choice and they can quickly provide the info you need to make the power you want and give the highest amount of service life for your engine. Piston coatings can be used to achieve a number of operational benefits and are composed of various compounds and processes from graphite to ceramics to anodizing, etc. Many piston manufacturers and coating companies have their own particular names for the coatings they offer but in order to simplify our discussion we will generally cover the chemical compositions and areas of the piston on which they are used. If you aren’t quite sure about the best piston design to use for your build (or specific features) call the manufacturer of your choice and they can quickly provide the info you need to make the power you want. • Ceramic coatings are used on the piston crown in order to reflect heat into the combustion chamber and away from the top of the piston. In certain builds, Ceramics can be utilized in the combustion chamber and on the valve faces to better control the thermodynamic characteristics of the engine and lower overall cylinder head temps. • Moly dry film coatings are applied to the skirts to reduce friction and help prevent premature skirt wear. • Oil shedding compounds are applied to the underside to help reduce the amount of oil that is clinging to the piston and adding weight. These type of coatings can also be applied to the crankshaft and connecting rods in order to achieve the same purpose. • Anodized coatings can be employed for multiple applications. When applied to ring land areas anodizing can provide wear resistance and help prevent the piston rings from micro-welding to the ring grooves. Another form of hard anodizing is used to coat all the surfaces of pistons used for Top Fuel engines. This coating can withstand the higher temperatures and also helps combat the corrosive characteristics of nitromethane. Hard anodizing is also used on pistons for high boost and nitrous engines because it can handle the elevated temps and pressures of these builds. Pins do more than just connect the piston to the rod – they play a big part in making consistent power and helping to keep the engine alive. Failures blamed on the piston can often actually be traced to using the incorrect piston pin for the application. Viewing it strictly from a financial standpoint, upgrading pins can be a substantial increase to the overall cost of a set of pistons. If we continue to follow that train of thought however, it will eventually lead to the realization that a failure in this area can cause tremendous amounts of financial woes due to associated damage to other components in an expensive engine. For most naturally aspirated street engines and certain competition applications like late-model stock circle track for example, the standard case hardened carbon steel pins will work fine in the 600-650hp range. But pin requirements could change for this level of power output when using nitrous oxide or a blower. It doesn’t necessarily mean that the pin material itself must be upgraded – sometimes utilizing a thicker wall pin of the same material can compensate for the extra pressures placed on the engine. My main focus here is to get you to think of the wrist pin as more than just an attachment device. High horsepower NA builds or engines that have big boost numbers being pushed through them must use pins that can endure the pressure and RPMs. In other applications though, a pin upgrade can enhance performance and provide additional insurance against failures. There are numerous design features that can be added to most forged pistons that will give you a longer service life in a performance or competition build and also help deter operational issues that could arise. There are some combinations that we use for certain circle track engines that are well below the horsepower levels that would dictate a heavy duty upgrade but by using DLC coated pins we substantially reduce friction and have no concerns about them lasting for an entire season of racing. When choosing the pistons for your next build take the time to evaluate the possibilities of benefits that can be derived from matching the wrist pins to the exact application that the engine will be used for. There are numerous design features that can be added to most forged pistons that will give you a longer service life in a performance or competition build and also help deter operational issues that could arise. Things like contact reduction grooves, dual pin oilers, lateral and vertical gas ports, accumulator grooves and internal milling just to name a few. All of these are listed on the piston manufacturer’s websites with complete descriptions of the purpose for each feature. There have also been changes made to the axial and radial dimensions of piston rings that are being used in performance applications to achieve more power and better sealing qualities. 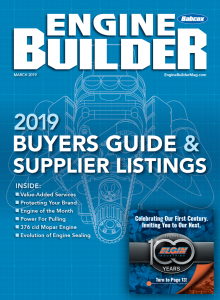 Choosing the right piston and pin configuration will reward you with the confidence that the cylinders are filled with exactly what your engine and customer needs.